I really need to get to Alaska. I’ve said this before, after interviewing Iditarod musher,Debbie Moderow. Now after talking with author, Brendan Jones, the pull is even stronger. After reading his novel, The Alaskan Laundry, I can almost feel the frigid air. Those who love to read a good story. Those who want to write a good story. Brendan takes us through a fictional journey based on part of his own life. He’s full of encouragement to those penning their own works of words. My life is better after having a conversation with him. You, too, can have a conversation with Brendan. 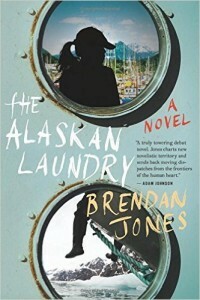 He’ll be promoting The Alaskan Laundry at the downtown Powell’s location on Tuesday, May 10 at 7:30pm. Stop by and hear his fascinating tale about finding Alaska to find himself. And fish. He found lots and lots of fish.